There's a ritual dedicated sports gamers go through with each new season. The excitement of peeling the shrinkwrap off the latest edition of NHL or NBA 2K quickly gives way to the realization that, once again, we're going to throw away our promising careers. With MLB The Show, that will soon come to an end. It won't, technically, happen next year. But MLB 14 The Show, as was announced last night, will lay the foundation for importing a career from an older version of the series into a newer game. So when MLB 15 The Show arrives, no longer will your player have to start all over in the minor leagues. Nor will you have to tear down that five-time World Champion dynasty like it's the Florida Marlins having another one of their execrable fire sales. You'll load a save file, and pick up where you left off, in the latest version of the series. Sony's San Diego Studio, the makers of the series, dropped the news last night during the MLB Players Association's Players Choice Awards. Detroit's Miguel Cabrera may have been named player of the year, but the players' union to which I belong—video gamers—immediately gave The Show our unanimous MVP vote. People were ready to crown it the Sports GOTY sight unseen, all because of "career importation," a long begged-for concept that has always seemed to have some roadblock in its way. For those who don't play sports video games that much, here's what's going on: Each edition of a sports title—your Madden, your FIFA, etc.—is a discrete environment. What happens there stays there. Win the Super Bowl eight times in the franchise mode of Madden NFL 13? Sorry, bud, you're starting over in Madden NFL 14. You're given a choice: Continue with the old game—with old uniforms, outdated commentary and other features—or grab the latest and greatest and begin again. Further, in "Road to the Show"—in which you control the actions and the career of a single player, rather than an entire club—your journey always begins with a stint in the minor leagues, one which for sure will last one season and frequently goes the better part of two. In every new edition of The Show, you start out backtracking through backwaters you've already toured—New Britain for the Twins, Iowa for the Cubs, Altoona for the Pirates. Ostensibly the goal of that mode is to make the National Baseball Hall of Fame. I have never come close to a 10-season career. 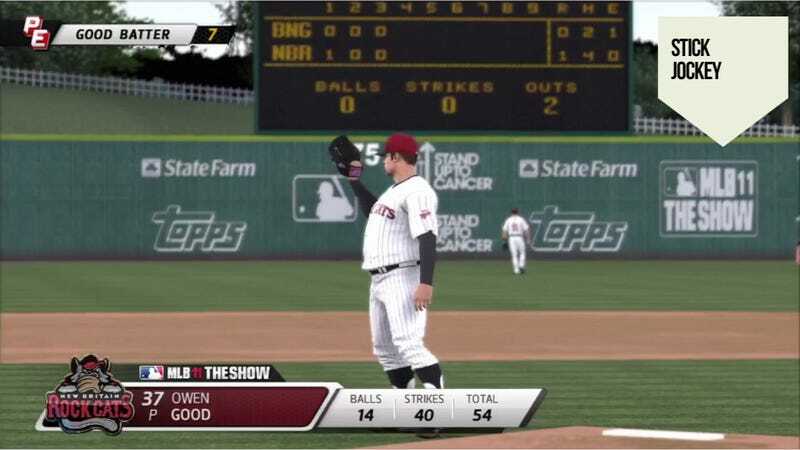 The longest I've gone is four major league seasons, as a pitcher, in MLB 11 The Show. While any game may be simulated, as a starting pitcher, you'll get 32 starts not counting the postseason—double what you'd play in a season of Madden. Simulating games is always abhorrent to me, it always feels like a giveup (ask the commissioner of my current Madden and NCAA dynasties) and I never do it in the minor leagues, where leveling up your player and fulfilling performance expectations is critical to getting called up by the parent club. So each March I do my time in the minor leagues. Even if the game added seven new minor league parks this year, it is a crushingly dull assignment. Most of the players are computer-generated ringers until you get to Triple-A—where you start over from the bench or the bullpen and work your way back into a starting role. The Show's commentary—the most glaring shortcoming of an otherwise outstanding series—is at its worst here, having few, if any real players with a backstory for the broadcast team to discuss. The developmental drills—particularly the pitching accuracy exercises—are frustratingly tough and disconnected from most live-game applications. What MLB The Show said last night is, I only have to do that one more time. I can create Owen Good in MLB 14 The Show, make the majors, and never look back. I could play out the rest of my seasons in real time and, assuming the series lasts this long, hang up my uniform in MLB 34 The Show on the PlayStation 7. Why did it take this long to get this breakthrough? People assume there's some sort of dark publisher motive behind it, to keep each edition distinct and drive people to buy the next one in the series. I have no idea how allowing a gamesave to carry forward disincentivizes the purchase of the latest edition of the series. If anything, knowing that I can take my lapsed "character" and still play him in the best-looking, best-playing edition of the series gives me even more incentive to get back on the wagon and pick up the new $60 game when it releases. There are, inevitably, technical limitations, which I may not completely understand but I don't discount. Iterative video game titles have a codebase stretching back years, if not more than a decade, and altering some fundamental part can create bugs and glitches elsewhere that aren't worth the trouble. Even if the roster you are using diverges wildly from real life, there's a question of maintaining that state in the next edition, and how it draws on the resources of the next game. What if The Show changes how it models players? What if a team changes uniforms, ballparks, or even cities? How is that squared? If you continue with your reality—the rosters, uniforms and ballparks of the old version—then those outdated assets must somehow be preserved on the future game. Licensing may also be an issue, frankly. What if a guy retires—like Mariano Rivera—and leaves the MLB Players Association, but next year he is on a save file in a 2013 season that still needs completion. Technically, Rivera is appearing in MLB 14 The Show. Should he be replaced with a ringer? This is something Sony San Diego has thought about for years. I know, I recall discussing it with them in 2011, and while not infeasible, the message was that setting up, testing and bulletproofing a career importation feature—something that appeals strongly to the diehards but barely makes it to the bullet points on the back of a box—would take time away from delivering other improvements gamers expect. My guess is the new opportunities offered by advanced hardware made this the best time to go for it. Video gamers who don't play sports titles might wonder why sports fans feel such regret starting over year to year. After all, each successive chapter of The Elder Scrolls or Fallout require you to start from level 1 and work your way up again. Even series with perk systems or quasi-role-playing features, like Assassin's Creed, contrive a reason to start from scratch in the next chapter. Those are imperfect comparisons. A sports video game inhabits a more persistent and open ended world, even if it's one played entirely offline. A more apt comparison would be having to start over your character from level 1 in an MMO like World of Warcraft whenever its latest expansion releases. People there would, justifiably, throw a fit. I'm of the opinion that sports games' career modes require even more grinding. Yet virtual athletes are the ones asked to throw away all of their work when the game updates. Eyes now turn to other series, and whether they will follow suit. NBA 2K and NHL, which simulate 82-game seasons, would seem to be series in need of such a feature. FIFA, drawing from an even larger roster pool, comprising dozens of domestic football leagues (whose clubs drop in and out of licensing agreements with EA Sports) would seem to be much more problematic. Madden NFL will play two dozen games, counting pre- and post-season, each virtual year, making it less of a need. The new Connected Franchise mode may also offer complexities as you're talking about seasons that can switch between being played by only one person, and then joined by up to 31 of his friends online. But it had to happen first in baseball, because of the length of its season and the lengths of the careers there. Hell, the Franchise mode is set up to last 120 years! That's why sports video gamers were practically fanning themselves on Twitter when they heard the news last night. Where other next-gen sports titles are counting grass blades and zooming in on jersey fabric, The Show just up and announced a readily understandable feature that responds to a loyal community and improves their long term experience, even if its benefit won't truly be delivered for another 14 months. Come March, I'll be back in Double A, biding my time with the Montgomery Biscuits or the Tulsa Drillers or the Chattanooga Lookouts. But I know that it'll be the last time I have to go down to the minor leagues. That once I make the Show, I will stay with The Show. For good. I think Sony gets that. I hope others will, too.